Cause I knit entirely too tightly! I don’t know exactly why though. Forest canopy is coming along nicely. Though it won’t be an FO anytime soon. Poor thing. As of right now there are about 240 some odd sts on the needles and so far it is only about 1/4 of the way done. I need it to be AT LEAST 4-5 x’s this size in order for it to be how I imagine it. Sorry I don’t have any pictures for you. Got a couple more dishclothes done. Spent a little money on here and here on etsy. I really love this site! I got my mom hooked on it too. If you have never checked it out go do it now. There is sooooooo much cool stuff there. And all of it is hand made or home made. Way cool. Had alot on my mind lately. Basically just been itching to cast on something new. Anything. I don’t care. I am just getting really bored. I am loving the shawl but want more for some reason. I have heard the term “starteritis” and I wonder if maybe I have been infected. I still have to finish the fingers on my second HFMGloves, redo the foot of my socks, and a couple other projects I would like to finally be finished with. But I just want something new and exciting I guess. I need to get Calorimetry started and finished for Mom. She has also requested a pair of fingerless gloves. That may take a while as I am all gloved out. Besides I need to find just the right shade of red to go with Calorimetry. Red is her absolute favorite color but she is very picky about her reds. And I want to make at least one more hat for Scott so that he can have one to travel with. He is in broadcasting and travels constantly for long periods of time. But he refuses to take the one I made him out of his house for fear of losing it! So I must make him more! I want to make something for Jeff but I just can’t think of what to knit him. He is not big on knit caps cause he prefers baseball caps. Doesn’t wear scarves or gloves. I don’t want to do a sweater just yet but I guess I could make him socks. I will have to think on it a bit. I also got tagged to do a couple of meme’s but I think I will wait a little while before actually doing them. Oh. BTW. My (online) friend just got married today! Drop on by and wish her lots of Mazel Tovs and Congrats will ya!? I am so excited for her. Oh, she also knit up the most beautiful pair of stockings for her wedding. Her choice in colors were just great! She really did and AWESOME job! Congratulations Alyson & Travis!!!!!! Oh and I forgot to tell you. I cut my hair. Really short. Used to be well past my shoulders and now it is at my jaw line in kind of a bob. I miss my long hair but it feels so nice to have short hair that is easy to manage. Especially here in the desert. I am gonna go to bed now. Before I fall on my face. I currently have 135 sts on the needles. 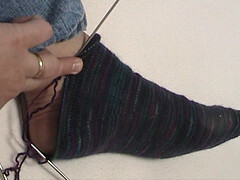 Pattern calls for enough repeats to have 195 sts on the needles. Since I am using laceweight with US 4 circs and not sport weight on US 8 needles I will be doing quite a bit more than that. So far so good.